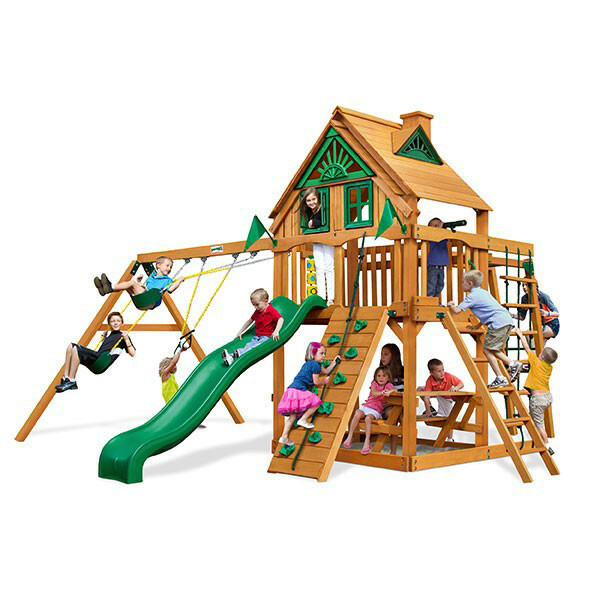 Everything kids want under one attractive wood roof, the Gorilla Playsets Navigator Treehouse has all of the best features kids love. 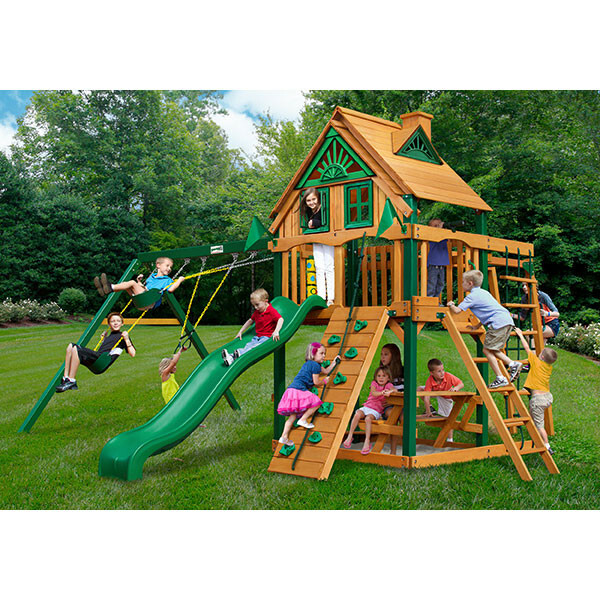 They will love climbing to the 5 foot high platform using the rock climbing wall with rope or the safe entry ladder. The rope ladder also provides a great place to exercise those muscles. Once on the platform kids can look out the treehouse windows that have working shutters or flex their imaginations with the tic-tac-toe panel, telescope, or steering wheel. Zooming back to the ground is a blast down the wave slide and once there kids will find great fun swinging on the two belt swings or trapeze swing. 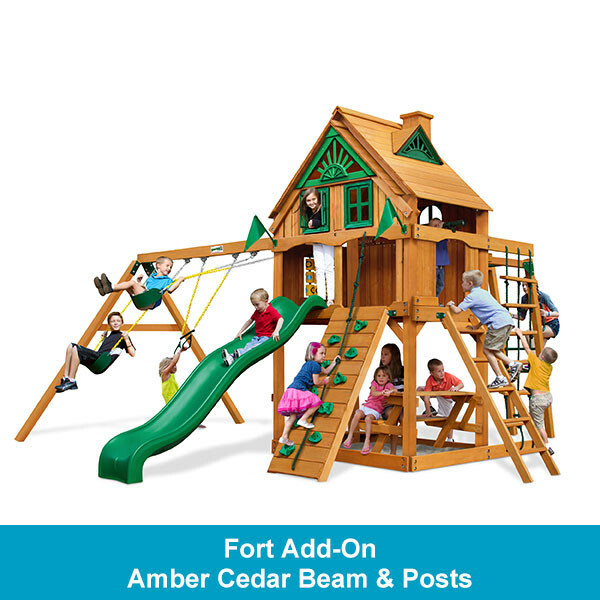 They can relax on the built-in picnic table or dig in the sandbox area as long as you fill it with your own sand first. A unique feature not found on many Gorilla swing sets is the set of monkey bars that lots of kids love. All of this and an attractive wood roof with dormers, chimney, and sunburst design are yours in one ready-to-assemble package delivered to your door. 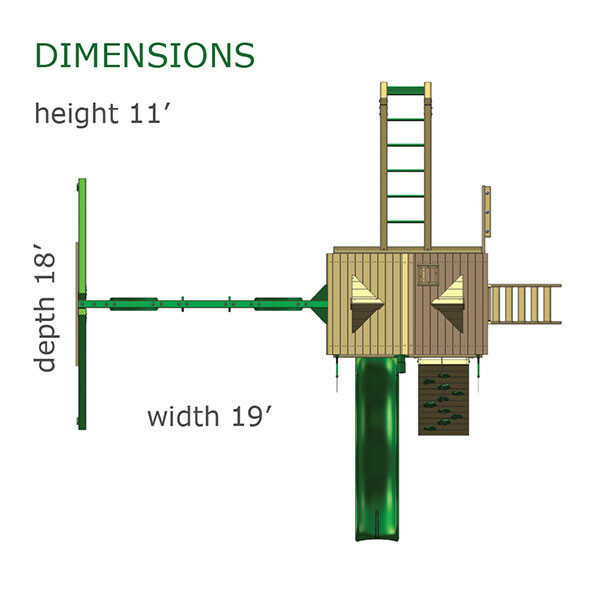 All of the necessary hardware and lumber is included along with a step-by-step illustrated instruction manual. The lumber is all pre-cut, pre-sanded, pre-stained, and various pieces are pre-drilled for your convenience.